The rustic beauty of Vintage Casual design comes to life with the rich finishes and shaped metal of the "Pinnadel" dining collection to enhance the look and feel of any dining area. With the beauty of Pine veneers bathed in a wire brushed gray-brown color finish and Multi-Colored stool design options to choose from, this furniture is perfect for any dining experience. Tables and some stool accents made with select pine veneers and solids in vintage wire brushed gray brown color. Stool frames made from tubular, stamped sheet and solid bar metal with a gun metal finish. 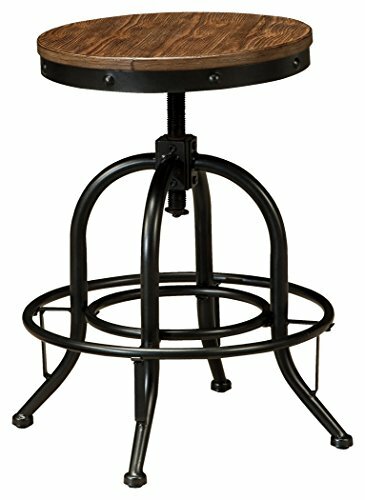 D542-124 and -130 stools have metal frames, wood cap rails, wood base with swivel. D542-124, -130 has cushion seat in vintage brown faux leather with nail head trim and metal footrest. D542-224 and -230 stools have metal frames, wood planked seat with adjustable height swivel and metal footrest. D542-024 and -030 stools are made from stamped sheet metal in a retro design with tubular X and stretcher bracing and a convenient handhold cut-out in the seat. D542-024 and -030 have nesting design for compact storage. Product dimension: 17.50"W x 17.50"D x24.00"H. The product comes in Light Brown color. It is manufactured in China.